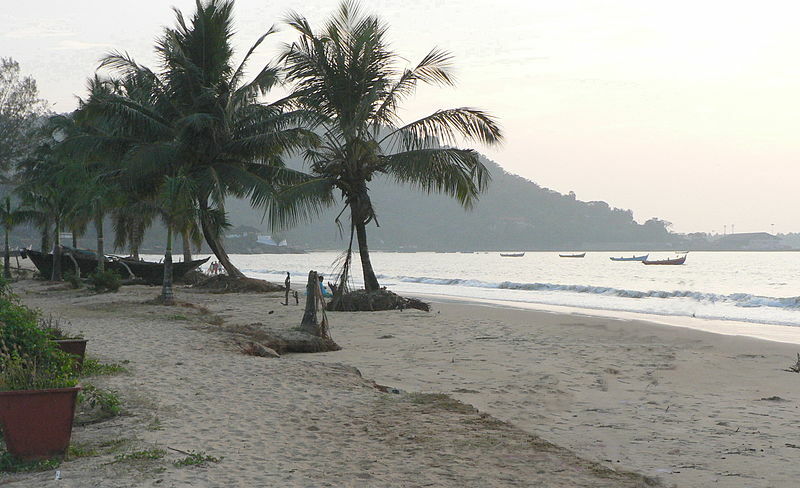 Importance: One of the most Pristine beaches of India. 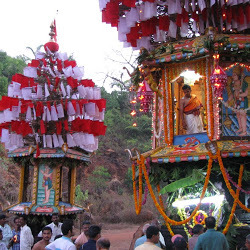 Karwar has sacred pilgrim centers, historical towns and some of the most beautiful beaches in the country. It is said to have inspired Tagore to pen his first drama. 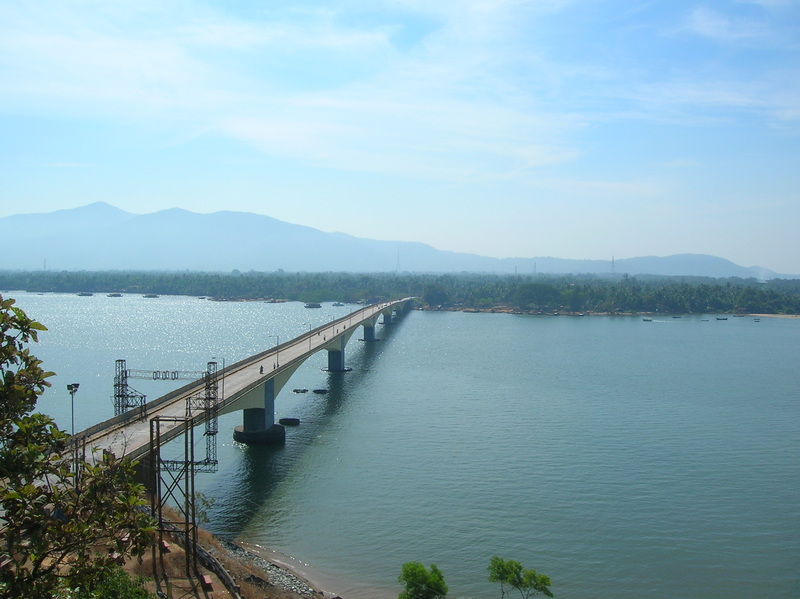 519 kms north-west of Bangalore is Karwar. 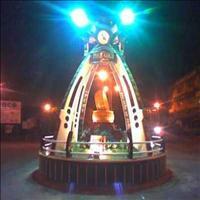 The district headquarters of Uttara Kannada, this is an ideal place to relax. 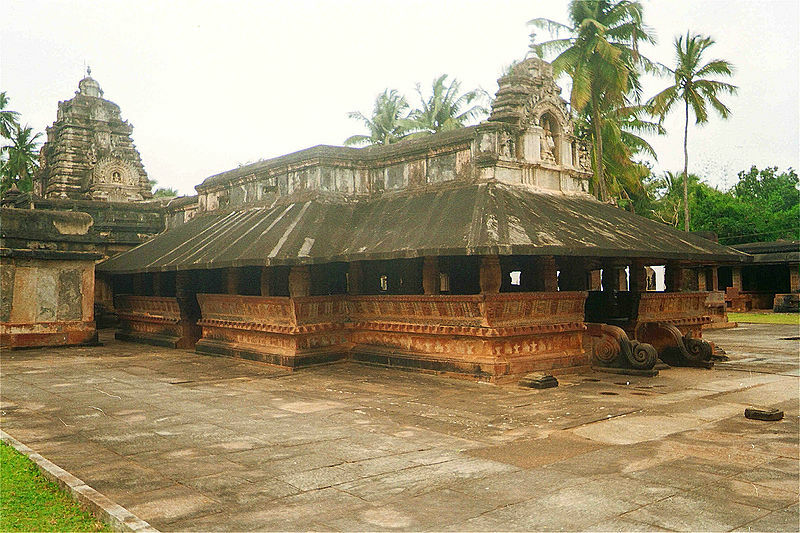 Located 140 kms from Karwar on the left bank of the Varada river, Banavasi is a temple town mentioned in the Hindu epics, the Ramayana and the Mahabharata. 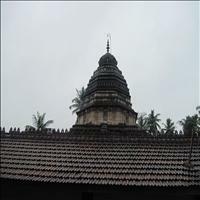 Once the capital city of Kadambas, the main places of interest here are the Madhukeswara temple, the ruins of a Buddhist stupa, the Veerabhadra temple and the several idols and the Jain icons. 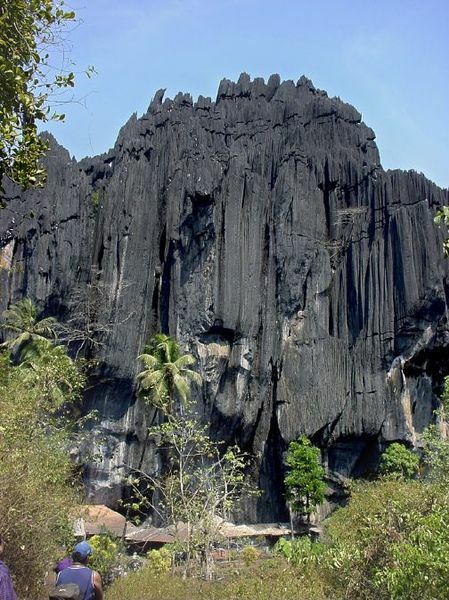 Situated 60kms from Karwar, Yana or Bhairavakshetra is a deserted town ship and an important pilgrim centre with unique rock formations. 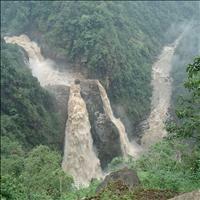 Located in a beautiful valley, one has to trek a distance of about 10kms by foot amidst thick forest to reach Yana. It is a popular rock climbing haunt. 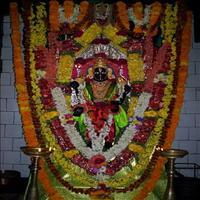 There is a shrine of Bhairaveswara on a hillock 100metres high. A fair is held here during Shivaratri. 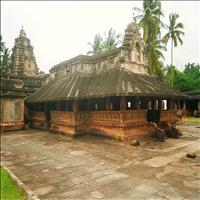 Ulavi, a famous pilgrim centre is located 75 kms from Karwar (via Kumbarawada). Thousands come here to pay homage to the samadhi of Veera Shiva Saint Channabasavanna, who took refuge here from the army of 'Kalachurias'. 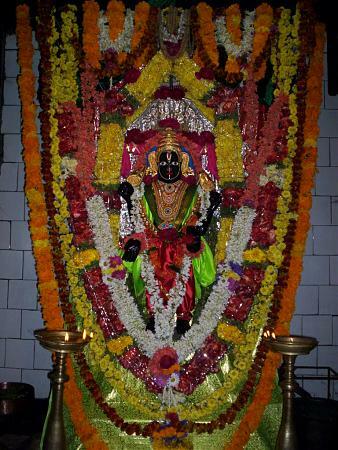 Ulavi 'Jatras' attracts devotees from all over. Honnavar, situated 90 kms from Karwar, has a Portuguese fort. There is also a fort in Basavaraja Durga Island, amidst the sea which can be reached by a sail upstream on river Sharavathi.\r\nGeresoppa the old capital of the Queen Chanabhairavi, 30 kms from here has a beautiful 14th century Chaturmukha Basti. The boat trip to Gerosoppa with coconut groves and lush greenery covering the banks, is memorable. 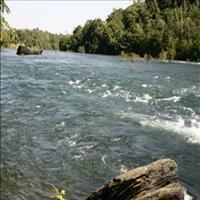 Located 93 kms from Karwar, Dandeli is a popular holiday resort and an industrial township. 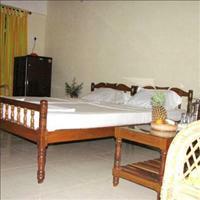 The wildlife sanctuary here in an area of 207Sq.Kms abounds with a variety of rare animals. The watch tower inside the sanctuary are inaccessible during the monsoon months of June to October. This forest region is famous for its paper, plywood, teakwood and Ferro-manganese factories. The cave with Shivalinga-like laterite formations is also worth a visit. 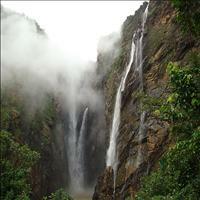 110 kms from Karwar, the famous Lushington Falls or Keppa falls is located in Siddhapur Taluk on the Shimoga border. The falls where the river Aghanashini thunders down from the height of 116 meters is named after a District Collector who discovered it in 1845. The Magod is 125 kms from Karwar. 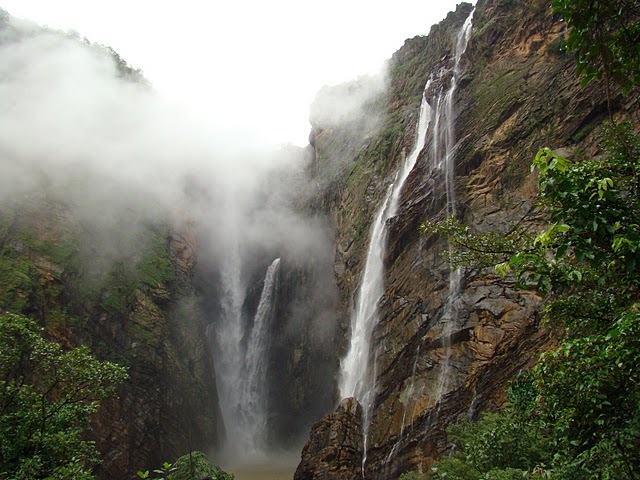 The river Gangavathi emerging from the Western ghats takes a leap into a chasm of 183metre (600 feet) down, in a series of cascades over the cliffs presenting an enchanting sight. 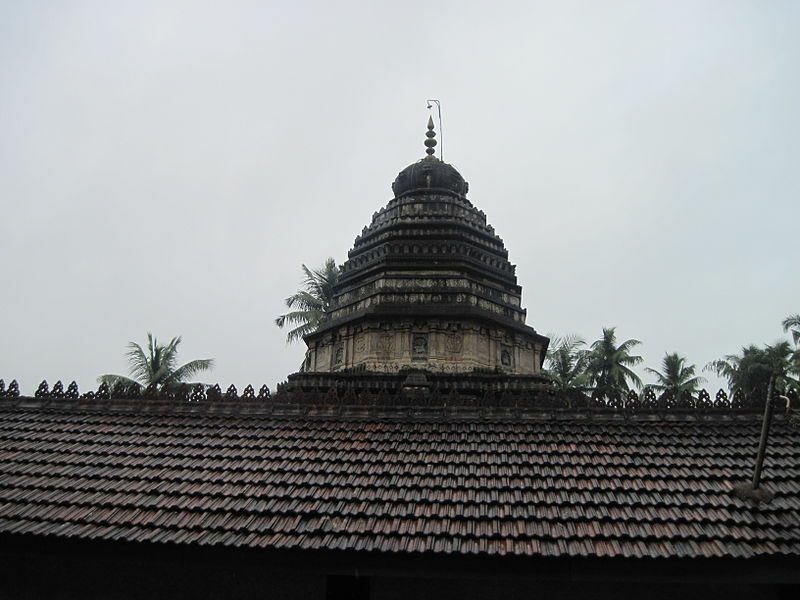 Located 37kms south of Karwar, is a small town with 15century ruined walls of king Sarpamalika's fort and the ancient Shri Venketaraman Temple. Near the temple there are two giant wooden chariots carved with scenes from the 'Ramayana'. 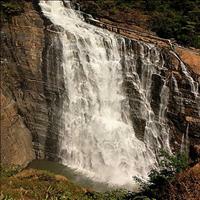 Jog falls, the highest waterfalls in India, is located about 50kms from the coast midway between Udupi and Karwar. The Sharavati river drops 253 metres in 4 separate falls known as Rani-the Rocket and Raja-the Roarer. The highest is the Raja with the fall of 253 metres and a pool below 40metres deep. After rain during the monsoon season, the falls are a magnificent spectacular sight. The best time to visit is Late November to early January. The 50km long Hirebhasgar Reservoir and the Linganamkki damregulates the flow of the Sharavati river to generate the hydro electricity. The Inspection Bungalow has excellent views. 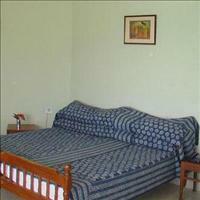 Reserve in advance for overnight stay.